Description How long can you keep bouncing? 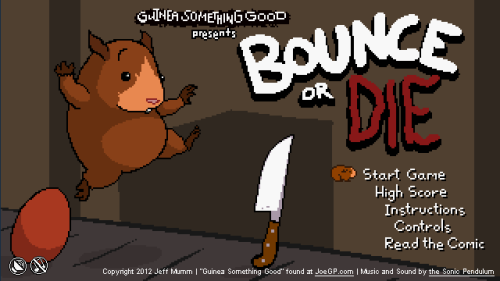 You're Joe, a guinea pig dropped into a factory, and your mission is to keep bouncing or die trying! Avoid sharp objects, and bounce as much as you can on the bouncy ones! Can you get the High Score? Bounce on bouncy objects consecutively to get more and more points. Avoid sharp objects, or you will get hurt! Avoid the chute at the end of the conveyor belt, or the game ends. Grab the hamburger to double your points on every bounce! Grab the coffee to jump higher, faster, and further! Grab the elusive Joe pog and get a quick 800 points! Funny, extremely addicting and pretty nice pixel arts.